In the early days of struggle for gay rights, movement leaders often despaired of the community’s more outrageous members, especially those who rebelled against society’s gender norms such as butch lesbians, men who dressed in drag and effeminate men who camped it up in public. At a time when gays were viewed as deviants, it was tempting to push the opposite message, that gays and lesbians were just like everybody else—ready to tie the knot, adopt children and settle down in the suburbs. Harry Hay was having none of it. 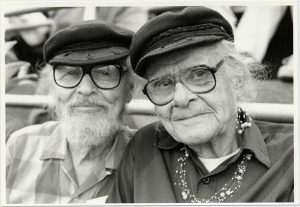 John Burnside, left, and Harry Hay with matching caps, June 25, 1994. Photo: S.F. History Center, San Francisco Public Library. Hay, who founded one of the first gay organizations in the country—the Mattachine Society—in 1950, was a communist and labor advocate. In today’s parlance he might be called gender fluid or gender nonconforming. In 1979 Hay founded the radical faeries, a New Age group that held its first get-together at Sri Ram Ashram, a gay-friendly spiritual retreat in the desert near Benson, Arizona. Hay and his partner, John Burnside, hosted regular faery circles at their home in Los Angeles, featuring discussions, dancing and other recreational activities. By the time I met Hay in Los Angeles in the early 1980s, he was a fixture in the community, an elder statesman and visionary who challenged conventional wisdom and called on the gay movement to reject assimilation with the larger, straight society. In the summer of 1982 I recorded a brief interview with Hay outside the Century Plaza Hotel, where 10,000 people staged a peaceful protest against President Reagan’s supply-side economic policies while the president attended a fundraising event inside. The recording has been preserved thanks to the ONE National Gay and Lesbian Archives at the University of Southern California. Hay, now considered the father of gay liberation, died of lung cancer in 2002 in San Francisco at age 90. His ashes were scattered in the Nomenus Faerie Sanctuary in Wolf Creek, Oregon.